The existence of a problem of knowledge depends on the future being different from the past, while the possibility of the solution of the problem depends on the future being like the past. In the presence of the possibility of the future being different to the past, suggested solutions include the use of judgement and heuristics. This post focuses on the particularly thorny issue of forecasting inflation in times of uncertainty, such as the conditions surrounding the UK’s Brexit vote, and discusses a possible solution by Bank of England (BoE) chief economist, Andrew Haldane. Haldane drew from the analogy of the dog and the Frisbee in the hope of curing complexity with simplicity. After the Brexit vote, sterling dipped to a historical low against the US dollar. In the events surrounding Brexit, a number of steps have been taken by the BoE to restore confidence among market participants as well as maintaining liquidity and lines of credit. 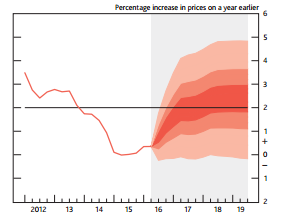 While the BoE was dutifully performing its historic and recently reinstated role of financial stability, it also provided its view of the world in terms of a short-to-medium term outlook for the economy, and in particular about the rate of inflation. 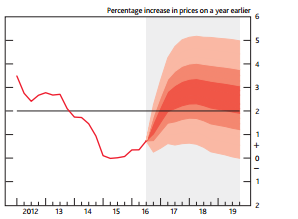 Before June 2016, BoE forecast suggested that inflation was expected to remain below the 2 per cent target until early 2018. Moreover, in the central view of the forecast, inflation would have been overshooting its target by just a quarter of a percentage point by the beginning of 2019. Sterling had in fact begun to depreciate after the EU membership referendum had been announced in February. However, the inflation forecast in May 2016 did not show much of revision on the February forecast; rather, there was a downward revision of the central view, suggesting (mean) inflation would be just 0.23 per cent above target. To be precise, the forecast showed a downward revision of 0.02 per cent. Furthermore, even after the referendum and sterling’s accelerated depreciation (which has theoretically and empirically positive effects on the rate of inflation), and the BoE decision to revise down its GDP forecast, the inflation forecast was not subject to any considerable revisions. Prima facie evidence suggests that the forecast did not take into account the depreciation of sterling. Interestingly, the Bank of England’s own 2015 estimates suggesting substantial pass-through, indicating that the 17 per cent appreciation of sterling that had occurred since the spring of 2013 would reduce the level of the consumer price index by around 3-5 per cent. Ignoring the dynamics of the exchange rate for inflation and concomitantly for monetary policy formulation is not wise. Despite the recent decline in the impact of exchange rate pass-through in some economies, exchange rate fluctuations are still important for inflation and economic activity. Therefore, monetary policy must continue to take these fluctuations into account to ensure that inflation expectations remain well-anchored. In fact, there is a possibility that exchange rate pass-through may be occurring even faster today than in the past, accelerating the immediate impact on inflation. After the Brexit vote, the BoE made the first rate cut since March 2009 by cutting the bank rate to a new all-time low of 0.25 per cent. Furthermore, the Asset Purchase Programme (quantitative easing) was also extended to £435 billion, and the Term Funding Scheme was also announced to further ease the supply of credit. These expansionary monetary measures may have some implications for the inflation. Thus, it would be fair to ask why, despite such expansionary stances and sharp depreciation of sterling, the inflation forecast was not substantially revised. Specifically, in terms of forecasting, incorporating the effects of exchange rate pass-through into a model often helps in obtaining superior forecasts of inflation. This is elaborated further in Figure 3. Figure 3: CPI inflation projections based on market interest rate expectations & £375 billion asset purchases: Source: Author calculations based on BoE data. Figure 3 depicts the CPI inflation projections based on market interest rate expectations and £375 billion in asset purchases (which was extended after August 2016). It is clearly notable that each period’s projections have started from the higher point after the arrival of new data. However, there seems to be no major revision in the forecast in the short-medium term. 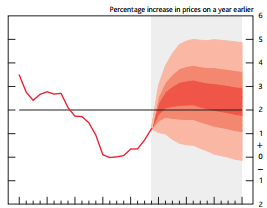 Figure 4: CPI inflation projections based on interest rates constant. Source: Author calculations based on BoE data. 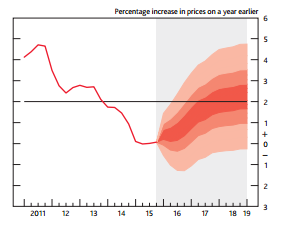 The scenario in Figure 4 shows the CPI inflation projections, based on the assumption of interest rates being constant, and compliments the outlook in Figure 3. This weak performance of the forecast – what Andy Haldane called the Michael Fish moment – raises concerns about the underlying framework being employed. One explanation could be the underlying workhorse model of the forecast, that is, the COMPASS which appears to be comparatively less effective in producing good quality forecasts for the short-to-medium term, and particularly in the aftermath of financial crises. By this token, it could also be that in very complex and unprecedented situations, the reliance on this complex model has not helped. It could also be that despite the depreciation, the inflation forecast was not revised because of another assumption which was to turn out to be wrong; that is, the sharp contraction in the economy was viewed through the lens of the Philips curve. It is an interesting thought to entertain that the forecast of inflation was completely unchanged because of an assumption coupled with an axiom (indeed an axiom, the Philips curve, which has often been absent in recent years). Of course, it is possible to argue that, in terms of forecasting, Brexit is an unprecedented event, so historically it is not possible to compare it with any past experiences of depreciation. However, this would suggest that the possibility of an uncertainty-abundant environment has been overlooked, despite the strength of economic theory on this issue. In short, there prevails a state where we can be certain about uncertainty. This then leads to the next logical question: what tools are at hand when one is faced by decision-making under uncertainty? With the benefit of hindsight it is easy to critique the forecasts made by the BoE; however, it also raises question about alternative methods of forecasting – perhaps inherently simpler methods might give us some insight into the future in complex situations. Forecasts are always uncertain, and this inherited uncertainty is exacerbated when coupled with an uncertain environment. Robert Skidelsky argued that BoE forecasting models were based on unrealistic premises and assumptions. The predicted fall in sterling was assumed to lead to a cut in consumer spending, while people are in fact ‘creatures of habit’: ‘The models of quantifiable risk fail when faced with radical uncertainty’. Seminal work by Daniel Kahneman and Amos Tversky substantially contributed to the notion of heuristics and rules of thumb. The use of heuristics is in fact very common in our lives. The reason for the ubiquity of heuristics or rules of thumbs can include the cost of processing information in a complex environment, that is, ‘bounded rationality’ and ‘satisficing’. However, it is not only the matter of efficiency; heuristics could, in fact, lead to a better decision. An economic forecast based on an econometric model and very short sample can be a victim of overfitting, and mistaking noise as a signal. This effect is more pronounced when the parameter space becomes larger: simply, a small sample and large parameter space lead to a worsening performance of complex models. Hence, the “recognition heuristic” can outperform the complex methods of predictions. Experimental evidence suggests that simple rules and heuristics are helpful in health, criminology and crime prevention, investment in stock and consumer behaviour. While optimal decision-making involves probabilistically weighting all possible future outcomes, the issue is that in an uncertain environment the probabilities are unknown. Concomitantly, it makes the past probabilities a poor guide, and weighting them an unfruitful endeavour to predict the future. In such a situation, ignoring weights (tallying) leads to better predictions. If that is so, in respect of the issue of Brexit and the associated complexity of inflation, could forecasting have been based on a simpler rule? This brings us, finally, to Haldane’s dog and Frisbee. Among the limited points of consensus, the difficulty of forecasting is prima facie, particularly when faced by high-level uncertainty. It is also evident that the compasses of a forecasting framework based on complex models and past observations performed worst when the tides of uncertainty were high at precisely the moment when these compasses are very much needed to give us some insight into the future. The alternative suggested by the proponents of simplicity, judgment and heuristics might have been helpful in these circumstances. In relation to the post-Brexit forecast, it is obvious that the aspect of pass-through was ignored when it came to forecasting inflation. 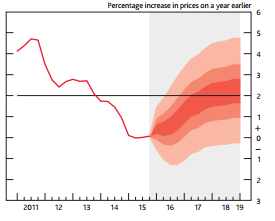 The interesting aspect is that there was substantial evidence that the exchange rate appreciation in the period between 2013-2015 had been weighing on inflation, leading to inflation persistently under-shooting the target. However, in the period after the referendum, when the exchange rate sharply depreciated, this nexus seemed to be forgotten or condoned in the projections of inflation. Catching a frisbee is difficult. Doing so successfully requires the catcher to weigh a complex array of physical and atmospheric factors, among them wind speed and frisbee rotation. Were a physicist to write down frisbee-catching as an optimal control problem, they would need to understand and apply Newton’s Law of Gravity. Yet despite this complexity, catching a frisbee is remarkably common. Casual empiricism reveals that it is not an activity only undertaken by those with a doctorate in physics. It is a task that an average dog can master. Indeed some, such as border collies, are better at frisbee-catching than humans. So what is the secret of the dog’s success? The answer, as in many other areas of complex decision-making, is simple. Or rather, it is to keep it simple. For studies have shown that the frisbee-catching dog follows the simplest of rules of thumb: run at a speed so that the angle of gaze to the frisbee remains roughly constant. Humans follow an identical rule of thumb. The notion that a longer series or more data can be helpful becomes paradoxical when put together with a simpler framework to avoid over-parameterisation. Such a simpler framework suffers from the curse of the future being different from the past distributions. Hence, instead of using more data, a simple rule of thumb which can be based on using relevant data from the similar episode can be a useful to make a judgment in addition to the workhorse model employed by the forecasting institutions. In this way, by using heuristics and rule of thumb, we can guide the model based on before the model can guide us. Our uncertainty about the present, and immediate future, would have been much reduced – by simply accepting that there exist uncertainties which complex models cannot account for, and which are vulnerable to errors of human judgement.